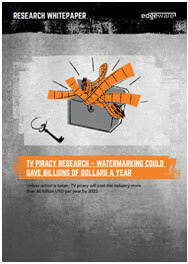 Unless action is taken, TV piracy will cost the industry more than 60 billion USD per year by 2022. New research from YouGov PLC, commissioned by Edgeware, provides insights into TV piracy and its effect on the television industry, based on samples of over 4000 adults across three markets (UK, US and Hong Kong). To what extend do viewers watch pirated content? How does this affect the television industry? What can be done – is watermarking a solution? Please complete the form on the right to receive your free electronic copy. Thank you for your interest in our products. We have emailed the Whitepaper to you, but you can also download it directly using the button below.